Don’t be deceived by the outward appearance of this sort of home. The brick on the outside is there largely to look pretty. Its the timber frame hidden in the walls that is keeping the roof up over your head. It is the same timber frame that termites are so good at finding. 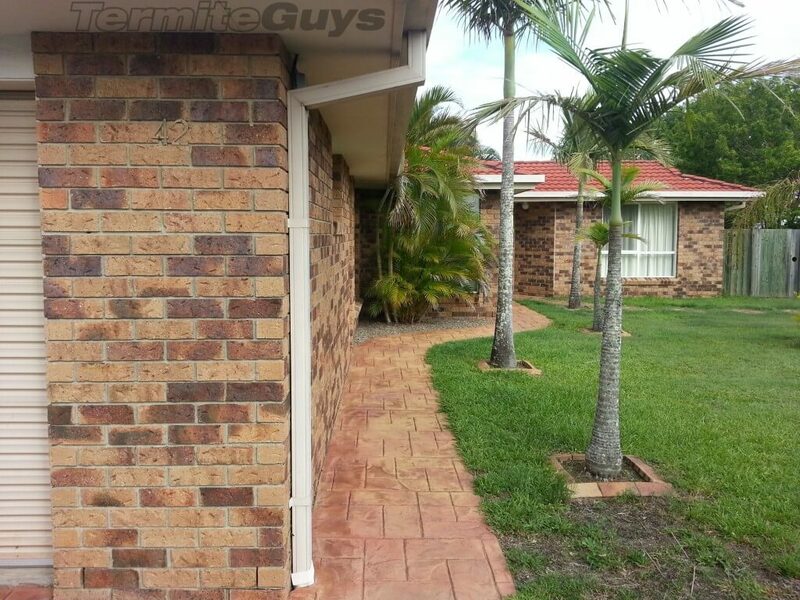 Brick veneer homes are the most commonly attacked house type in Brisbane and the damage tends to be more severe because of its concealed nature. Attacks are normally discovered when someone accidentally pokes a finger through some damaged trim like a skirting board, door frame or window frame. At this stage it is already too late, they’ve been at the frame for months already. When the wall linings are removed the results can be devastating, indeterminate damage stemming well away from the original entry point. If it’s load bearing the repairs can be costly and once they get going in the roof it can be a write off. Termites enter these builings through concealed gaps below soil level. Poor mortar work, service penetrations (such as where plumbing or electricity enter) and hidden slab joints are commonly utilized, with a few more exotic pathways sometimes found as well. They hit the internal house slab and work their way upwards, humidifying and mudding as they go. Just above them lies the bottom plate of the wall, a convenient superhighway to the rest of the timbers of the house. Safe in the wall cavity they are free to go about their business and that’s exactly what they’ll do. Hardwood is no deterent, there is a local species (Nasutitermes spp.) that actually prefers it. In houses with Meranti or MDF trim particular care must be taken. Termites aren’t huge fans of either. You might think this would be a good thing, but we’d rather have them munching on some skirting than concentrating of the house frame. In these houses termite damage can be exceptionally bad before it is discovered and the first visual signs of infestation can be the wall buckling or massive discolouration of gyprock from a huge mudpack behind it. 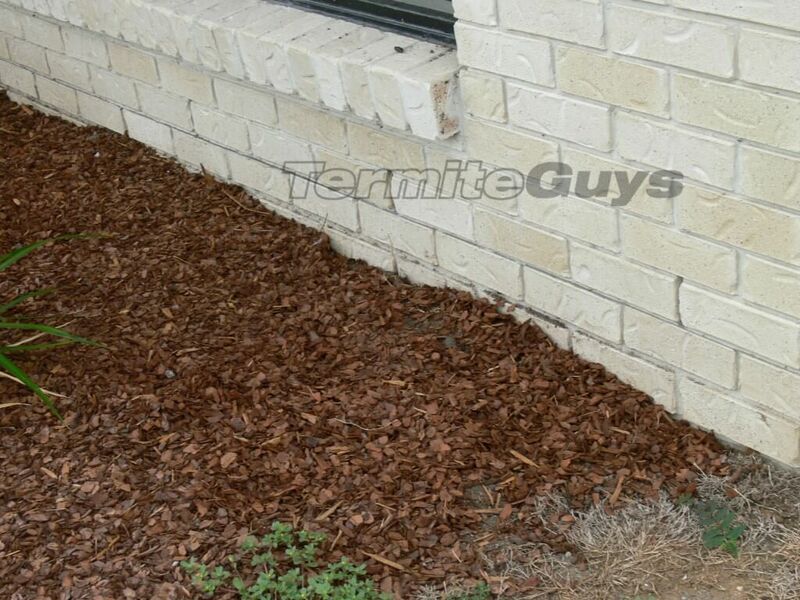 Wood Chip (Termite Food) covering the weep holes of a Brick Veneer home making easy access for Termites. These homes often have mortar ‘dags’ or render ‘dags’ that cover the foundations. Excess mortar or render is flicked onto the footings during construction that prevent chemical from reaching the true entry point. This excess concrete must be removed in the process of chemical treatment but can still remain under inaccessible areas such as hot water systems, paths and driveways. Disconnecting the hot water system or organising a concrete cutter may be essential to ensure treatment to the highest standard. Quality treatment (via dusting, foaming or baiting) at the initial stages is also essential, killing the nest before other treatments like chemical perimeters are utilised. The best option is (of course) prevention. Keep your termite management system up to date. Regular termite inspections are always a good idea but absolutely essential in this kind of building. 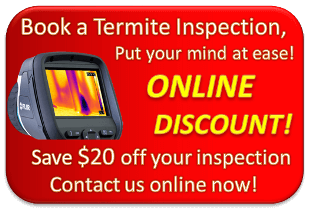 Call the Termite Guys to book an inspection or quote today!